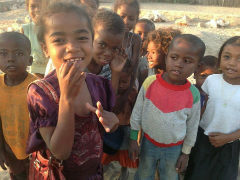 After witnessing the difficulties facing the more developed parts of Madagascar, OM Madagascar sent a research team to the isolated southern parts of Madagascar in the beginning of 2011 and have had a team based in Ambovombe Androy since 2012. 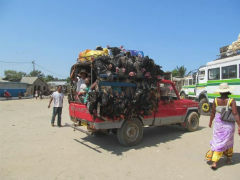 The team found a people that were not only challenged by the broader economic conditions of Madagascar, but also struggling to survive in the face of continual drought and famine. The Androy region is an isolated area where people live in the dry, harsh and drought prone terrain suffering continual conditions of drought and famine. The population is approximately 1 million people divided officially into 881 communities (the Antandroy people). 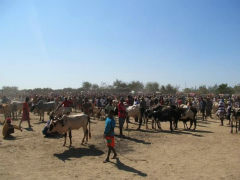 They survive mostly on their cattle and they also farm. The literacy rate is around 30% and these people are considered to be the poorest of the poor. This project aims to bring social and economic empowerment and will involve an adult literacy programme, business skills training, savings groups and micro-loan programmes. They want the people to be set free from a relief and aid mentality and experience rehabilitation and development. Since 2012 OM, in association with Bright Hope World, has had a micro-loan project in Antananaraivo which has proved to be very successful (Project Namana - MAD01). OM Madagascar has learned a lot from this initial project and has prayerfully developed a plan to commence a development project into the Androy region. The main beneficiaries are women and young people. The polygamy system among the Antandroy people makes women very vulnerable, they are treated as mere objects. They are not seen as valuable. The culture also exposes young girls to arranged marriages, many of them get married at a very young age and get little or no education. We already have a relationship with the key people here so we have a good and growing understanding of our partners. 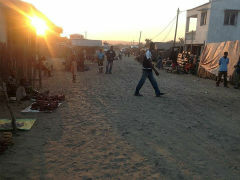 This partnership is in an area that is exactly where BHW does it's best work - rural, poorest of the poor. This is a strongly church based programme with good connection to local churches. It addresses development issues from the get go with poor people and has a strong training component to it. 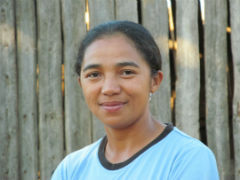 Fara Rasoanoro is part of the OM Madagascar Androy team and grew up in Antananarivo. She had been working in a garment factory but resigned from her job after she received her calling into mission. Her heart for the unreached people made her commit to work in Androy after her mission training with OM Madagascar in 2012. She has been trained to teach adult literacy. She has a long term vision to work amongst the Antandroy people as she says "I will be here until I see lasting fruit, multiplication and ownership of the work by local people". She is working with other team members in the South and alongside the local church leaders. Hanrita Andrianomanana (the key person for MAD01) oversees the team from within the country. The vision is to see the Antandroy church bringing relief and transformation in their community by addressing the high need for education, social and economic empowerment. They want to create a more positive future for the women and children of the Androy region. The annual budget here is US$5,500. $500 will go towards business training, $750 towards literacy training and the remainder to micro-loans. They are initially intending to help 50 people.